"Environmental advocates Scardina and Flocken profile the grassroots organizations, tenacious scientists, and willful philanthropists that shape today s conservation policy and practice. Each portrait centers on a threatened or endangered species and describes the life and work of the person who has dedicated his career to protecting the species from extinction. Organized into sections corresponding to the four elements Earth, Water, Air, and Fire with introductory essays by celebrities like Ted Danson, the subjects are grouped according to their habitat, with Fire focusing on the broader threats to the world s ecosystems. The pithy summaries of the activists struggles are accompanied by informative tidbits about the biology, behavior, natural history, and cultural context of the target species, along with delightful photographs of both human and beast. From the grassland-dwelling maned wolf of Central South America to the iceberg-hopping emperor penguin of Antarctica, the book shows how negative human interference imperils the welfare of all living things, and suggests that by taking an active role in conservation, education, and community building, we can help prevent the tragic loss of the world s biological diversity." 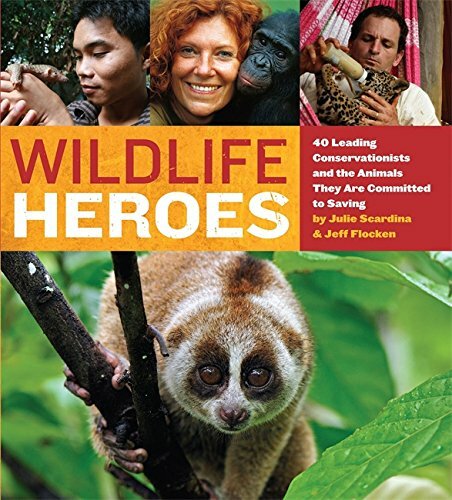 ""Conservationists Scardina (a regular on Today and The Tonight Show) and Flocken have created an alluring book of dazzling photographs and stirring stories of adventure and breakthroughs that introduces intriguing "wildlife heroes" and portrays the imperiled animals they have dedicated, even risked, their lives to save this keenly charismatic, solidly informative call for the preservation of life affirms that it is still possible, with concerted effort, to save animals from extinction."" "Environmental advocates Scardina and Flocken profile the grassroots organizations, tenacious scientists, and willful philanthropists that shape today's conservation policy and practice. Each portrait centers on a threatened or endangered species and describes the life and work of the person who has dedicated his career to protecting the species from extinction. Organized into sections corresponding to the four elements--Earth, Water, Air, and Fire--with introductory essays by celebrities like Ted Danson, the subjects are grouped according to their habitat, with "Fire" focusing on the broader threats to the world's ecosystems. The pithy summaries of the activists' struggles are accompanied by informative tidbits about the biology, behavior, natural history, and cultural context of the target species, along with delightful photographs of both human and beast. From the grassland-dwelling maned wolf of Central South America to the iceberg-hopping emperor penguin of Antarctica, the book shows how negative human interference imperils the welfare of all living things, and suggests that by taking an active role in conservation, education, and community building, we can help prevent the tragic loss of the world's biological diversity." Julie Scardina is the Sea World, Busch Gardens, and Discovery Cove Animal Ambassador. She serves on the board of the SeaWorld & Busch Gardens Conservation Fund and is actively involved with several other conservation organizations including the World Wildlife Fund. Julie has appeared on Larry King Live and Dr. Oz . She is a monthly guest on the Today Show and a regular guest on The Tonight Show with Jay Leno as she has for the past 14 years. Jeff Flocken is the DC Office Director for the International Fund for Animal Welfare (IFAW). He also works on campaigns conserving whales, polar bears, elephants, lions, and a variety of other species through this position. Jeff worked for five years as an International Affairs Specialist in the U.S. Fish & Wildlife Service's Division of International Conservation. He lives in Arlington, VA.